- create a tangle of shadows on the snow. Alders are tough grow-anywhere plants that curve and wiggle their way into whatever patches of sunshine they can grow into. 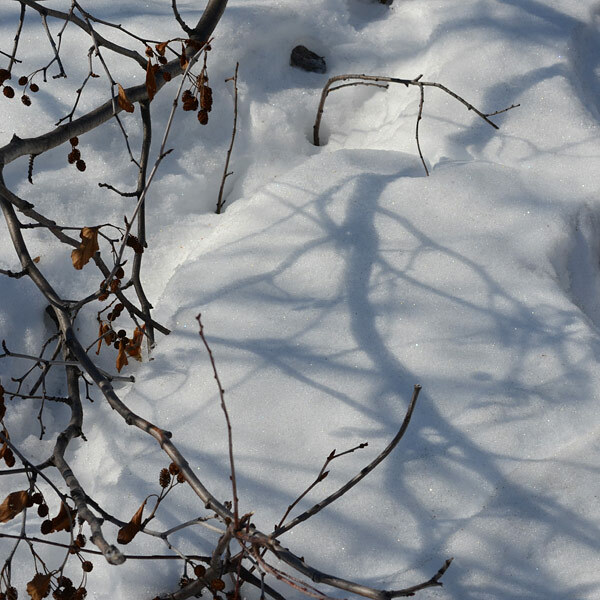 On a white snow background, the branches and cones of a wintertime alder bush make a complex shadow design. What would happen with about 45% of the width cropped off the left side to leave just two ends of twig bracketing the shadow? I am liking the shadow here much more than the branch itself. Hmmmmmmmmmmmm.